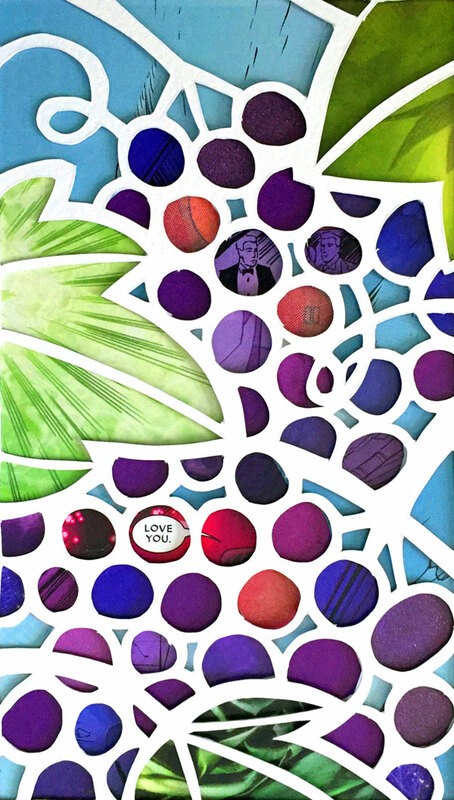 Isaac Brynjegard-Bialik: Nice Jewish Artist: You May Kiss the Groom – Both of You! 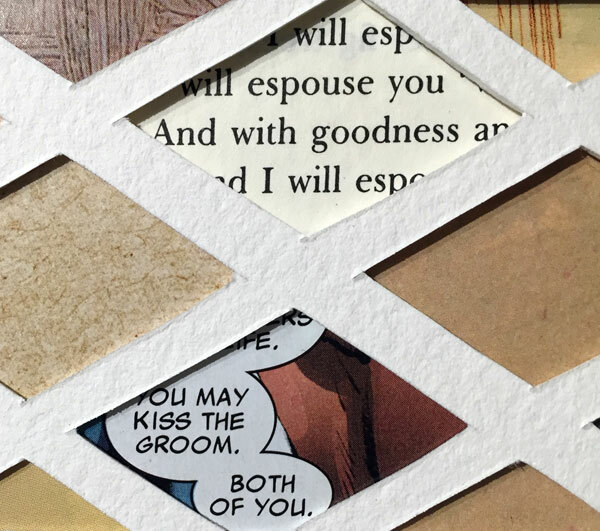 You May Kiss the Groom – Both of You! Mazal tov to Meir Bargeron and Jon Tam! I am so pleased to share with you the Bargeron-Tam ketubah, which I created for them — and they just signed it and got married this past weekend! According to Kabbalah the four days between Yom Kippur and Sukkot are especially holy days, and excellent for a wedding — and Jon and Meir got married during that auspicious time. For that reason, their ketubah is a hupah and a sukkah. 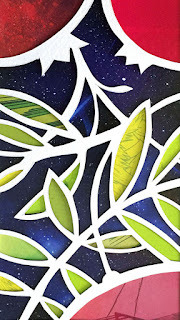 The sukkah has many parallels with the hupah, after all: both represent dwellings, and are places of peace and comfort. We invite guests to join us for both, and we celebrate with food and drink. The top of the ketubah is the sukkah’s lattice roof, filled with texts about marriage taken from comic books and the ketubah text. 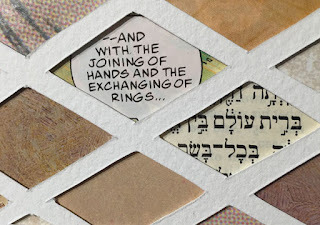 The lattice incorporates texts from comic books and from traditional texts referenced in the ketubah text – here, from the book of Bereshit (Genesis). 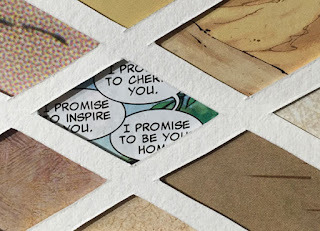 Here's where the ketubah gets its name from – text from X-Men #51 (August 2012). 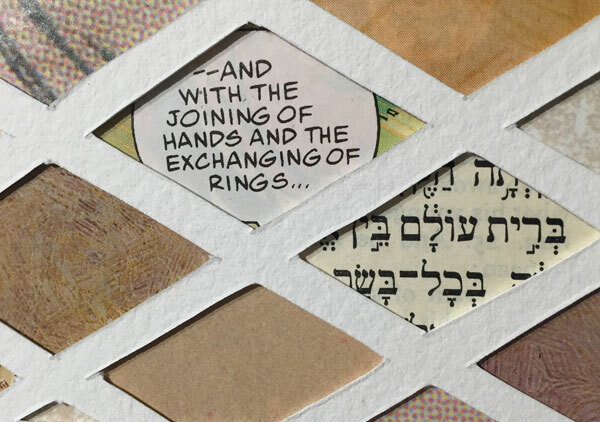 Also, text from the book of Hosea, referenced in the ketubah text. 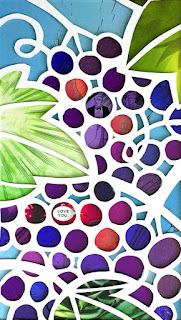 Grapes and pomegranates climb alongside the English text: symbols of joy and family, and a reference to the wine Meir and Jon share under the hupah.